Allergy season is officially here. The warmer weather does not only bring with it the outdoor adventures but also the flea burden, risk of mites and/or tick infestation, and the unavoidable exposure to a multitude of pollen and grass. It can be quite stressful watching your dog obsessively chewing his/her feet or scratching his/her flank. 1. What do you feed your dog? Have you recently changed his/her diet? 2. Is your pet up to date with flea control? Yes, which one? 3. Do you live on a property? Any possible access to foxes or a range of plants/bushes? 4. Has your dog ever had any skin issues before? 5. Do you bathe your dog? How often? When did you do it last? What product did you use? I always take a deep breath before embarking on a skin consult. My primary concern is overwhelming my clients with all my questioning. I do my best to explain why each and every question is relevant. It always seems easier handling a client with a dog that has had its first skin flareup. However, for those clients who are frequent flyers, some can be quite understandably fed up with the whole interrogation process. I would really like to start by saying that a really good veterinarian will not offer you the quick fix solution. That’s easy, they can give your dog or cat a cortisone injection and send you on your merry way with a 1-2 week oral course of cortisone. The itching will stop and you will feel instant relief. However, the underlying problem would not have been addressed. After the cessation of the cortisone, your pet will more often than not have a relapse and you are back to square one. You have to fork up money for another vet visit. I often wonder if owners are pre-warned about the significant side effects that cortisone can cause their much loved pets. Just like in people, cortisone leads to increased eating, drinking and retention of water. In dogs, it can also unleash aggression. The risk with cortisone is increased with prolonged and repeated dosing and can even cause iatrogenic cushings or diabetes which are serious medical conditions. I don’t want to get on my soap box about cortisone being the enemy in treating skin issues. In reality, short term use of corticosteroids is definitely warranted in the early management of many skin cases like flea allergy dermatitis. Dogs that come in with self inflicted hair loss and thickening around the base of their tail combined with a flea burden will always need cortisone to dampen the overstimulated immune response. I often examine those flea allergy dermatitis cases after they have already been treated with appropriate flea control like Frontline, Revolution, Advantage or Advocate and they are still very itchy. These dogs are free of fleas but their body is still in a state of war against the previous exposure to a flea. Hence, the only solution is to cool off their immune system with some cortisone. During these in-depth skin consultations, I often get unstuck when I get clients misunderstanding my intentions. They think I just want to sell them flea control products or a new diet to make an extra buck. I am secretly gratified when some of these clients are adamant their dogs don’t have fleas and I reveal to them a hidden stash of them on their pets. I often wonder if they actually think I planted these live fleas on their pets just to prove a point, hehehe. I personally have had to prescribe cortisone in many cases, some of which I wasn’t particularly happy about. The animal was clearly suffering from a severe itch and his/her owners could only afford the dirt cheap cortisone tablets. If your dog stops itching when you have asked him/her to, then maybe he is just doing it out of habit. Yes some pets can become obsessive compulsive about chewing themselves purely from a medical behavioural point of view but those cases are not as common as you may think! Before you can assume it is a compulsive disorder, a full skin workup must be done to rule out any underlying skin condition. Food allergy isn’t always due to a sudden change in food. Your pet’s body may have been exposed to that particular allergen for some time and has suddenly developed a reaction to it. The most common age for dogs to develop food allergies is between 5 and 8 years of age. Veterinary dermatologists will ALWAYS ensure your pet has been on an appropriate food elimination diet (4-6 week duration) before they rule out food allergy as a possible cause forpet’s skin issues. We can’t always diagnose your pet’s skin condition in a single consultation especially if it has been long standing. Some cases can be quickly diagnosed in the consultation via a skin examination or skin scraping like flea or mite infestation. Others are often much more complicated and can be multifactorial and can take several weeks to months to definitively diagnose. 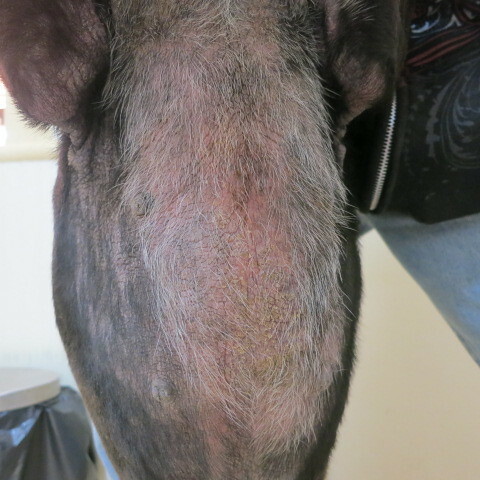 Chaos below had a classical distribution of skin lesions indicating he was suffering from mange. We did some skin scrapings and were instantly able to diagnose him and start appropriate treatment. Flea collars and supermarket flea products don’t work effectively. Flea collars definitely stop fleas from jumping onto your pet’s head and neck. However, these cheeky fleas have learnt they can escape the collar’s potency if they chill out around your pet’s bottom end. Supermarket flea products are cheaper for a reason; the quality of the product pays the price. Please be careful not to use a supermarket dog applicant on your cat as it can kill your cat > read Poison is Poison about this issue. The cheapest and best option for your pet’s skin allergy is not getting him/her onto cortisone as soon as the skin flares up. The only means to truly nipping it in the bud is trying to get to the crust of the problem! Yes this may cost more upfront with the workup: skin scrapings or even biopsies, culture of specific lesions, food elimination trial, introduction of a healthier diet that better supports your pet’s skin & so forth. However, if you tally up the all up costs of cortisone and frequency of visits to the vets with the full skin workup & in most cases the diagnosis and appropriate management of your pet’s specific condition, you will realise it would have always been cheaper to properly workup your pet. If you bathe your dog enough, you can definitely rid him of that awful dog smell. That is so far from the truth! 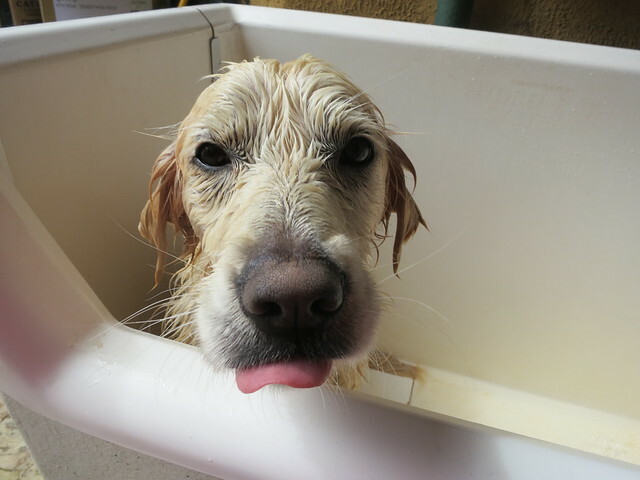 If anything, the more you bathe your dog, the more you rid him of his essential skin oils that support his skin barrier; this can make him/her prone to major skin flareups. You must always make sure to use a pet registered shampoo and keep in mind that your pet may potentially react to a specific shampoo. You shouldn’t bathe your dog more than once a fortnight or a month. I have only touched on a fraction of the information I would like to share with you about skin issues in your pet. Stay tuned for more in depth discussions about the intricacies of managing some skin disorders in pets. Next time, I will be talking all about gorgeous Lucy (pictured above), a 5 year old female de-sexed golden retriever, with some nasty dermatological issues . I am currently fostering and managing Lucy’s skin issues and will be giving you insight from both a veterinary and client perspective! ← I’m a vet and I love it.. So glad to see that you’re back. Yes, I remember the incident where you did your best and posted the story (with the family’s permission), only to be shot down in flames. Don’t worry. We all know you were doing your best. Don’t let it bring you down. I look forward to your posts and have missed them while you were gone. There’s always good information for pet owners. I look forward to more postings. Is it possible for a dog to be an allergies sufferer WITHOUT the scratching bit? That is my big question. Jasmine gets episodes of panting/pacing/distress which so far we were unable to find an answer for. Eventually, if the episode lasts long enough, she will lick and chew at her front feet. But the episode has to last 5 hours minimum. (duration random between 30 minutes to 36 hours). Her vet is quite convinced that this comes from allergies (histamine release leading to panting and increase in temperature, itching causing the pacing) but it does not match what we are seeing and how we understand allergies. Jasmine is not an itchy dog! She is the least itchy member of the household! So this has been a major dilemma for us. Hey Jana. I apologize about the late reply but I found your message in my spam. Firstly,I am so sorry to hear about Jasmine’s panting episodes.In all honesty, I think allergy sufferers usually display obvious scratching or chewing episodes. They mostly develop skin lesions. I have a few questions: how old is Jasmine, is she desexed, how long has she developed these episodes, is there a pattern to them, is there a trigger, are they seasonal? She seems either painful or distressed in the video. Has you veterinarian done full bloods, chest and abdominal xrays? I would be fully working her up. She sounds like a very complex case but the answer is there somewhere. I hope this information is helpful. I’m so glad you are back. Sorry we had to miss out on two of your posts – I really find them extremely helpful and useful. You are doing such fantastic work and I truly appreciate the effort you put into each post. Looking forward to hearing all the updates on Lucy and hope she is getting better fast. I am very touched with your lovely comment. Thank you for appreciating my work. Wonderful shot of Lucy – wet doggies do not always make good photo subjects, but Lucy’s portrait is a good one. Two posts in one day! It’s the best day ever! Owners these days may not know how lucky they are. There are so many great products for treating and preventing fleas, there are hypo-allergenic diets, there are effective medications. Skin issues make such a difference in the quality of life! I can’t imagine spending every single day itching like mad. I agree that the quick approach isn’t necessarily the best one. Heather you make a great point. There are a range of products now available that weren’t a few years back to help support you pet’s skin. Scratching non-stop is a form of suffering for your pet and must be addressed. We lost a much loved dog to skin issues many years ago. She was badly allergic to fleas, and we tried everything available at the time, including dusting the yard with pesticides. She was allergy tested at the university and had specially formulated allergy shots, but one flea bite was all it took. A few years after her death, truly effective flea control came on the market. Had it come out earlier, it could have saved her life. We are so lucky now! Hey Heather. It is very sad that you had to lose your dog. It is just unbearable to watch them struggling with a severe itch. Wonderful to have you back to blogging. Great post… We had a lab he is long gone now but he suffered from horrific allergies I cooked rice and hamburger, carrots, vacummed packed last 2 years of his life. Took a long time to find out what he was allergic to corn, wheat, lamb and chicken were huge triggers. Thanks for sharing you personal experience with your labrador. It is definitely not easy to determine the food triggers and can be quite a long process. Some dogs’ skin issues can be very challenging to workup especially if they have not been addressed in the early stages or are food related. My Lhasa Apso suffered terribly from a skin condition and it took us a long time to find a vet to actually diagnose her. By that time she had hardly any fur left and had weeping lesions all over her body (secondary infections). Apparently she had demodex mites and her immune system was not working properly to cope with them. My vet treated her with Ivomec over a period of a few months, going back for skin scrapings, etc., but it did the trick. She made a full recovery. I will be very interested to read your further posts on skin problems Rayya – the information will be helpful to so many pet owners dealing with this. Thanks for talking about your dog’s condition and highlighting the challenges you faced in her diagnosis. I wonder why the first vet didn’t do a skin scraping. Did she have sarcoptic or demodectic mange? With sarcoptes, if you don’t find a mite on the skin scraping, it doesn’t mean you have ruled it out as opposed to demodectic mange. We often get skin consults referred to our clinic. We definitely make sure to address all the issues and often book a minimum of half an hour consult period. This allows us sufficient time to appropriately workup any challenging skin cases. We often require regular revisits in the initial period to ensure our patient is responding to our treatment. I will definitely endeavor to tackle the skin discussion pretty well. Penny had demodectic mange, Rayya and none of the vets we took her to did a skin scraping until we found a vet called Willeke who was as caring and thorough as you are (she reminds me of you). She treated Penny for months until she got on top of the problem, doing regular skin scrapings, etc., so we became quite close and will be forever grateful to her; sadly for us, she is no longer a vet – she went on to become a human doctor. Is the reason for asking about Foxes because of Mange? When Midnight my Pit mix first came to live with me in a rural area where there are many Foxes she was diagnosed with Sarcoptic Mange. ( Midnight is from Manhattan , NY) BabyGirl did not show signs of the Mange but we treated both dogs with Revolution as Vet said BabyGirl could be a carrier. Midnight also has allergies and I bath her 1 a week with Medicated shampoo, Recently I was told to start bathing her 2 x a week. I have kept both girls on Revolution because of all the protections it provides and because of where I live . BabyGirl has allergies also and I was looking at some pictures of her when she was younger and she looked then as Midnight does now. BabyGirl doesn’t get all the hair loss like she use to. She doesn’t itch all the time but her paws get red and sore looking. This to has gotten quite better than it use to be. Allergies are so confusing when it comes to our pets. You are right. We ask about foxes because dogs mostly contract it from direct contact with a live/dead fox or even fox urine or stools. It is usually highly contagious to other dogs and can even be transmitted to humans. Sorry to hear about Midnight’s experience with Mange and hope you are managing her current skin issues well with the regular bathing. Is there a specific reason she is regularly bathed with the medicate shampoo? Is it pyohex for a dermatitis? Glad to hear Baby girl’s skin seems to be going okay. Yes allergies can be quite frustrating especially if your pet is highly sensitive. Keep up the great work with managing your babies’s skin issues. Midnight gets the baths because of the Dermatitis. It is just a medicated shampoo from the Pet supply store. The vet said it was working well and to keep it up. Midnight gets the Blisters and the hair loss. The scratching has gotten a lot better as long as I give her regular baths. She has been on prednisolone a couple of times and I have a supply for treatment on hand if she needs it. I try to limit how often I give it to her. She used to scratch so much she was getting open sores ad now she doesn’t scratch so intensely now and no open sores.She also likes Baths so that helps a lot. At one time I worked for an older vet who gave allergy injections as often as every 3 – 4 weeks. One day we had a substitute vet who was much younger, and she refused to give a steroid injection to a dog that had received one 3 weeks prior. She used a different medical protocol which, over time, was safer for the dog. The owner wasn’t very happy that her dog couldn’t receive the injection, and it was hard to make her understand why. Interestingly enough, the owner said at the beginning of the consultation that she wanted her dog to have an allergy injection even though “the last one didn’t work”. The dog had received so many injections that they were becoming ineffective. There’s no quick fix for allergies, is there? Back in the day, veterinarians only had access to very few products and so cortisone was one of the only things available to help relieve pets with allergies. We have come a long way from there and we can definitely help support the skin better. If your pet is appropriately worked up, sometimes you can have great results. However, other times it is an ongoing battle but you have manage your pet quite well. Cortisone is definitely not the long term solution. It is only a quick fix for a very short period. Hey Sherri. Yes it is great to be back. Thanks for caring enough and noticing my absence :-). With regards to Joy, fleas can live in the dirt and their eggs can also live in the carpet and with enough stirring, they hatch and the vicious cycle begins. The best thing to do is to use revolution spot on to protect Joy from any flea or mite infestation. With regards to her recurrent itching, it can be a lengthy process and you have already excluded a few potential causes with her corn/wheat/soy exclusion diet. The distribution of her skin lesions may be relevant. If you want to rule out her itching as being due to a compulsive behaviour, then you should trial her on cortavance spray. It is pretty straight forward, if she stops itching when you use the product then you know she is itching because she is in fact itchy. Hope this information helps. Goodluck! Thanks for sharing your own experience with skin issues. I mean you had it even tougher since Saffy developed her allergies quite early and was only a puppy. So I’ve always had my dog get itchy after kennel stays about 4 times a year. This time is super bad and so she got a cortisone shot one week. She is always on advantage monthly. She obviously is getting flea bites there and reacting but this time the cortisone did absolutely nothing. She kept itching. A week later another shot and an antibiotic. Vet suggests changing to revolution but I just gave a second dose of advantage so can’t give revolution until next month according to the vet so basically she will keep getting flea bites and responding with the shots giving no relief and we will start this over with her next kennel stay in two weeks:(. Sorry to hear about your pooch’s recurrent skin flare ups. Firstly, I think it is important that the kennel your dog stays at only accepts dogs that are flea treated as they obviously have a flea burden on the premises. Have you discussed your dog’s recurrent flare ups post kenneling with them? Secondly if spot ons like advantage or revolution aren’t doing the trick then maybe you should consider an oral form of flea control like Sentinel. Does your dog have seasonal itch or allergies, does it lick specific areas like its paws or scratch its ears regularly? It is important to support your dog’s skin with supplements like flax seed oil/omega oil or change her diet (consider vets all natural allergy food). Cortisone has lots of side effects and it doesn’t make sense to keep using it as a first line. It has its place and definitely is indicated when the skin is out of control. However, it doesn’t seem like the underlying issues are being totally addressed. Best of luck. Sadly I got upset and even brought it up to the kennel and the girl at the front desk seemed completely unconcerned with the fact that she got fleas originally there and now has bites every visit. Back easy our standard was to inspect boarders and treat if necessary. I was tempted to take her out recently and try a new place but she is such a high stress, anxious chichiahaha that putting her in a new place before I leave her for two and half weeks seemed a poor choice. I guess the results though aren’t worth it either so after this trip I won’t keep her there. Yes West Highland Terriers are super prone to skin issues. Glad to hear you have found a combination that helps manage her flareups. So I’m from California and my senior dog Herbie has been scratching himself intensively that he now has multiple scars on the back oh his front legs and his whole face is losing hair. His left ear is full of crust and it is passing in to his right ear. The part just on top of his nose is completely bare aswell. Recently I have noticed the hair above his eyes to be reducing. He would not stop trying to scratch his face so I bought him a head cone to prevent himself from harming himself more than was already done. I am afraid that whatever he has might be passing on to my two other dogs which have also been scratching and have several sacra on their bodies and one of them has two scars on her face one on each side. The one with the serious issue is Herbie but it doesn’t really seem to bother him as much as it seems it would but the smell is horrible and no matter what I do i can’t seem to make it go away. I have tried everything to stop him from scratching but it is just beyond my power. I would really appreciate your help to try to figure out any possibilities of what this might be. Thank you! Sorry to hear about Herbie’s escalating skin condition. Given the history that your other dogs have also become symptomatic, it is concerning that a contagious disease is occurring. Have you taken your dogs to the vets to get them thoroughly examined. As you would have appreciated in my post about itching dogs, you must go through a huge process of determine the possible causes and trying to eliminate each cause one at a time! I took Herbie to the vet today to get a skin scrape and we found out that he has sarcoptic mange. We began a treatment with ivermectin vaccinations every two weeks. Now we can finally focus on the real issue that was going on all along. It’s too bad I’m not allowed to really pet any of my dogs for now since it is contagious to humans aswell but if all goes well they should be clear in about 2 months. Thank you very much for your help and information! Glad to hear your puppy has started treatment as sarcoptic mange can be very irritating. I am not surprised he is still very itchy as he has still not been cured from his mange infestation. The mites must be moving around. Best to keep in touch with the vet treating your puppy to ensure treatment is effective. Goodluck. I have a Maltese x shi tzu male dog aged 8 years old and he has a horrible chewing habit which I assume is caused by some type of nervousness, which I have heard happens quite a lot in small dogs. He chews his paws constantly and his lower back until they are red raw and bleeding. I bathe him in hypo allergenic shampoos and conditioners and have tried oat meal type shampoos and various other treatments. I have taken him to get cortisone treatments before but they only last a few weeks and I cannot keep on affording it. I have even tried frontline and advocate and tablets for fleas which works, but he rarely ever has fleas. I try and distract him from scratching which only works for a period of time. I am know trying to get opinions and suggestions to help my dogs condition. Does anyone know any ways to help my dogs nervousness and anxiousness and relief for his skin? I hate seeing him suffering and I want him to be at ease now. Sorry to hear about your dog’s constant itching. Based on the history you mentioned, it doesn’t sound like your dog has anxiety. I don’t recommend you assume he does without effectively ruling out underlying allergies. Given he has responded to flea control, he may be suffering from flea allergy dermatitis which means he doesn’t have to be riddled with fleas, just one flea can cause him to have a massive reaction. He should be maintained on regular flea control. Did the cortisone injections help stop him itching completely? If the answer is yes, then that again indicates he suffers from a true itch and isn’t just chewing because of stress. Sometimes dogs that itch constantly due to unresolved skin issues can develop a psychological obsession with itching. my dog is itching so hard..that he cried while scratching…we visited the vet and injected ivermectin…my other dog has recovered bt EVO hasn’t.. wen i got him1st he has fowl smell…we go to the vet and put revolution…the smell goes away..now he is 4 yrs old..stil have the same issue…he always scratch..his hair are falling…his skin s very very dry..h has a lot of flakes.. im so worried about him..because he is such a sweet dog. thanks for your reply. Dear Leslie. Sorry about the late reply but I’m currently overseas. With regards to your dog, if has recurrent issues with his skin, you need to go through am am intensive elimination process with your vet. He will need to be regularly maintained on revolution including all other pets. Based on the brief history, you haven’t ruled out food allergy, contact allergy, atopy and so much more. 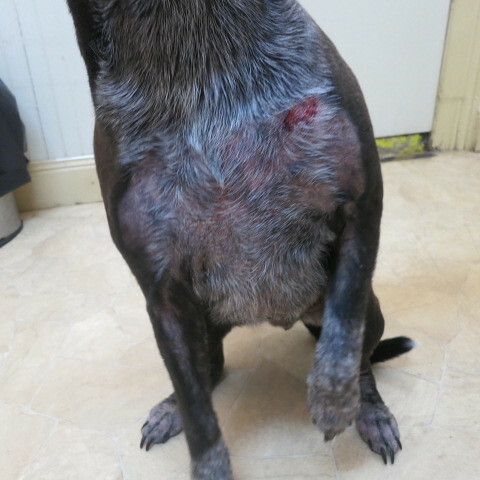 I highly recommend you follow up with your regular vet and hopefully you get to the bottom of it or at least find out the best way to manage the skin flare ups. Good luck and please let me know how you go. what do you mean by contact allergy and atopy? anyway, so far we have 4 dogs in the cage..bt they are n very good condition..they doesn’t itch like him…they also dont have foul smell..we have 4 months intensive medication with the vet..still the same…his falling hair wil heal,den later it wil recur agin. just ds week..some spot of his skin is wet nd slimy…wen it dries up it becomes very big flakes…im so worried.. we don’t want to go the vet anymore bcoz we almost run out of money..and still his condition doesn’t improve..we try eliminating food that would possibly cause of his allergy…but still the same…we tried all home remedy..still it my improved then later comes back agin… bt now we will try revoultion agin.. by the way.. how many months will we give him revolution? thank you soo much for your reply. Hello Leslie. Contact allergy is when your dog is getting into direct contact with the allergen causing him to itch. Common contact allergy is to grass. Atopy on the other hand is allergy to both inhaled allergens and ones directly contacted and is much more difficult to manage. It can be quite costly managing a pet with skin allergies but unfortunately there is not always a single cure and generally complicated skin cases require ongoing veterinary care. In theory, he should be on revolution on going unless he reacts to the product. I highly recommend you read all the related skin articles I have written about Lucy. Hello Dr. Raya – I am generally someone who looks at health holistically and am not a fan of broad spectrum products especially when dealing with skin issues. Over the many years of rescuing and fostering street dogs in India I have seen a lot of skin issues in dogs and really appreciate it when vets take the time to run through the list of questions to make a diagnosis. Even with strays where accurate medical and lifestyle histories are hard to obtain. However, it has been my experience, here in India, that many vets are very reluctant to do skin scrapping and cultures, even with pet dogs, and I simply cannot understand why they sometimes categorically refuse to do such a basic diagnostic test that is easy and painless. Especially when it can help rule out things and provide targeted treatment. Am I missing something here? I was hoping you could shed some light on this. Dear Aditi. Good on you for all the work you do with rescuing and rehabilitating strays. You are not missing anything at all. You are absolutely right, your vets should be offering a range of tests when working up any skin case. If they aren’t, it goes to show they aren’t experienced enough and are too old school in their treatment methods. Hope you can find a vet that’s graduated more recently and has the new skills needed for diagnosing, treating and managing a skin case. Dear Rose. Sorry to hear about Lucky boy’s recent skin issues. Unfortunately based on the information you have provided, I really can’t give you much advise. I’m not clear on what your vet has diagnosed him with. There is no skin condition that requires daily antibiotics for life. Sometime they require repeat courses when the skin flares-up… I honestly doubt an 8 year old dog suddenly develps major skin issues. They would usually start much earlier. So definitely worth ruling out parasites like fleas or mites using a proper product like revolution spot on used fortnightly for 3 consecutive treatments (that is off label use). It’s important for you to discuss all your concerns directly with your vet. You need to be confident in what he/she is saying and understand the diagnosis. Otherwise, find a new vet that you can trust and feel comfortable with. Hope this information helps. Please let me know how Lucky Boy gets on. Sorry to hear about Jasper’s skin issues. I can’t give you a solution based on the information you have given me. Skin issues are very complex. You are best to communicate directly with your vet. Goodluck. 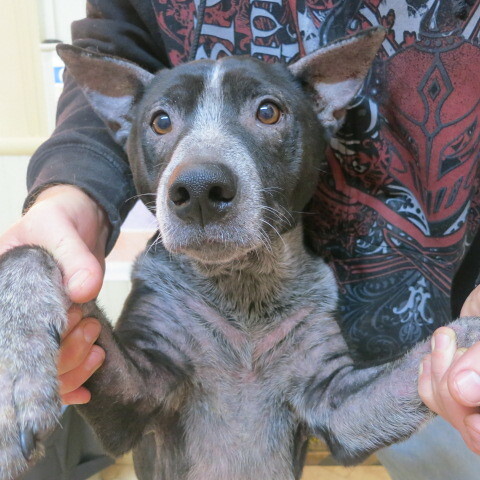 Dear Dr Rayya, We have a two year old staffy who has skin allergies. She has seen several vets as out of shear frustration we have been trying to find one who will reccomend something other than steroids. We have tried the food elimination and natural remedies but are unable to control it. The seroids are now causing vomitting and tummy upsets so we are trying not to use them. The latest vet who treats the staffy breeders dogs has told us that her allergies are environmental and so it is near impossible for us to control. We love our girl and hate seeing her uncomfortable. What can you suggest please? 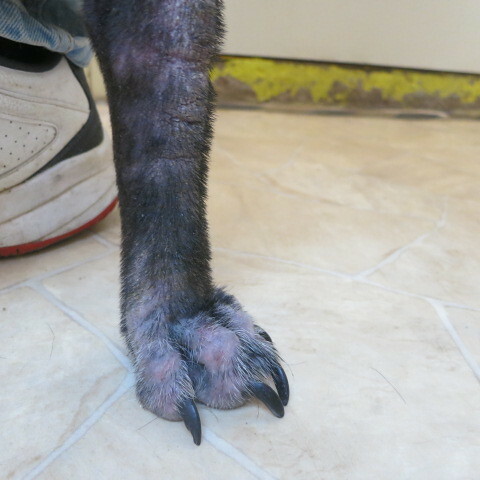 My Great Dane is suffering from skin issues and I was told it was Demodex mites. I was given Noromectin and it seems to be helping her during the day shortly after I give it to her, but at night she keeps me up scratching and chewing. My question is can I give her Melatonin at night to help her sleep and it not have a reaction to the Noromectin? I don’t recommend you give your dog anything that hasn’t been prescribed by your vet. It’s important to ask your vet directly about the melatonin. My lab has been on allergy shots for over 4mos. She is still itching and licking like crazy. She has recently developed a hematoma on her ear. I am doing steroids in conjunction with the shots. Nothing is helping. I feel horrible for her. What should I do? We have been contemplating putting her down. I know she is in pain, and nothing is helping her. Hi, we have a Staffy who is allergic to “well everything really”! We have it under control by administering 1/2 a 20mg Prednisolone tablet every second day. Pyohex cream on her paws and tail base. Which is a new found use for the medicated conditioner initially used after bathing. Definitely NO dog treats as they contain either sulphites or grains. NO human food. We feed her Purina Supercoat Sensitive Gentle Formula biscuits and Natures Goodness grainfree tin dog food. Both can be purchased from a supermarket. Her vet has commented how well she looks and her coat is so shiny. She is 95% under control. No scratching at all, just licks her paws occasionally after walking on the lawn. Yes she is allergic to grass too! On the rare occasionI that she does have a relapse we use Neocort cream if she gets sores and Cutaneous Spray solution for places where she may lick the cream off. Please post this as it has worked for our dog and I am sure it will work for many. We too suffered frustration for our baby in so much discomfort. She is now a healthy happy 2 year old puppy. My dog is insanely itchy. Has been for six months. Scraping negative. Responded well to course of oral steroid with antihistamine but itching resumed following course. Could it be mites anyway.? Im just searching in google and i drop by in your column about this horrible scratching of my fur baby husky… she is 6yrs old now and she had suffering epilepsy 3months ago and she is taking medicine for her epilepsy to…my far concern is she had scratching all over her body and i found out she had some hot spot wich i treat it early using vergin coconut oil and it comes out good but on her stomach,elbow and paws she still biting and licking furiously until sometimes bloods comes out iam so worried, i try to bring her in vet but they only do is soaking her in a bath and still not relieve her itchiness and it cost expensive….please give me some of your advises. My German Shepherd, Sasha, has responded with a hot spot and maddening scratching ever since I put Revolution on her just a few days ago. It has just finally clicked that this happened last year too. She is such a porch puppy as I call her, she only goes outside to do her business on a run. She is like a chow in that she doesn’t like to be out when it is wet and she is a Big Mama to my 10 cats, in fact, the real Mama cat and her are extremely jealous of each other, she prefers to be inside. I feel so bad for her!!! I have 21pills of 5mg Prednisone and 25mg Benedryl, she weighs 65Ibs. Can I administer these to her rather than taking her to the vet. She only trusts me and Gary. She is not socialized due to we live on the Toccoa river in the mountains of Georgia, it would cost me $187 just to get her seen with sedation, she is very protective of me and my husband and our kitty family. I love your blog. Im watching a friend’s roommate’s dog suffer on a minutely basis (every 15 seconds I would say). He’s scratching and biting himself. I can see his stomach move the way mine does when I have an eczema outburst. The itching is insanely painful at times until a topical solution is applied. The vet has given him meds but it’s been 2 weeks and it’s not working. I read online to put coconut oil on him so I did but it’s not working. Please help with advise!